Voters elected one mayor, six councillors and five school trustees for four-year terms on October 20, 2018. The results have been declared official by the Chief Election Officer. Local government elections in British Columbia are held every four years. This includes elections for mayors, councillors, school trustees, regional district electoral area directors, trustees for the Islands Trust, local community commissioners, and park board commissioners. Campaign Financing Disclosures for candidates in the 2018 general local election are be available on the Elections BC website. Each local government (municipality or regional district) is responsible for conducting its own general local election. Local governments may also conduct school trustee elections on behalf of boards of education. In West Vancouver, the municipality conducts elections for school trustees, for the West Vancouver Board of Education. Elections BC is responsible for managing campaign financing disclosure requirements, investigations, and enforcing the campaign financing and third-party advertising provisions set out in the Local Elections Campaign Financing Act. Elections BC's role also extends to by-elections and assent voting (referenda) held by local election authorities outside of the general local election cycle. “Elections are the most direct way for the public to directly influence their local government. During the election process, candidates generally outline their platforms and objectives if they were to be elected. By choosing the candidates with the ideals and qualities that are most acceptable to the electors, citizens can directly influence the type of community where they reside or own property. See the Guide to Supporting a Candidate for Local Government Elections in B.C. for additional information about how to support candidates in local government elections. not be disqualified under the Local Government Act, or any other enactment from being nominated for, being elected to or holding office, or be otherwise disqualified by law. not be disqualified under the Local Government Act, the School Act, or any other enactment from being nominated for, being elected to or holding office, or be otherwise disqualified by law. Under the Local Elections Campaign Financing Act, all candidates, elector organizations, third-party advertising sponsors and non-election assent voting advertising sponsors must file a disclosure statement with Elections BC. A disclosure statement discloses all campaign contributions, election expenses, transfers, surplus funds and other transactions related to a local election or assent voting. Disclosure statements must be filed within 90 days after General Voting Day for a local election or assent voting. Disclosure statements may be filed for another 30 days (120 days after General Voting Day) but must be accompanied by a $500 late filing fee. Searching disclosure statements and significant campaign contributors: the Elections BC Financial Reports and Political Contributions (FRPC) system contains scanned images of all disclosure statements (including amendments) filed with Elections BC under the Local Elections Campaign Financing Act, beginning with those filed for the 2014 General Local Elections. Please contact your local jurisdiction for information about disclosure statements for local elections that took place before the 2014 General Local Elections. The FRPC system also includes information about contributors who, during a general local election or by-election, made campaign contributions with a value of $100 or more to a candidate or elector organization. Other information includes the date and value of each contribution and the class of the contributor. If the contributor is an organization, the names of two directors or principal officials are also disclosed. You can vote in the West Vancouver election for mayor and councillors, and school trustees if you are a resident of West Vancouver (“resident elector”), or own property in West Vancouver even if you don’t reside in West Vancouver (“non-resident property elector”). not disqualified from voting in an election or otherwise disqualified by law. A person may register as a non-resident property elector only in relation to one parcel of real property in a municipality or electoral area. Requirements to vote for school trustees are the same as those for resident and non-resident property electors, except that the elector must be a resident or the registered owner of real property in School District 45 for at least 30 days immediately before the day of registration. School District 45 includes: West Vancouver, Lions Bay, Bowen Island, and part of GVRD Electoral Area A (which includes part of the Gambier Island Local Area Trust). You can check if you are registered to vote by visiting the Elections BC Online Voter Registration website. If you are not on the Voters’ List, you can register at the above site online or update your information. 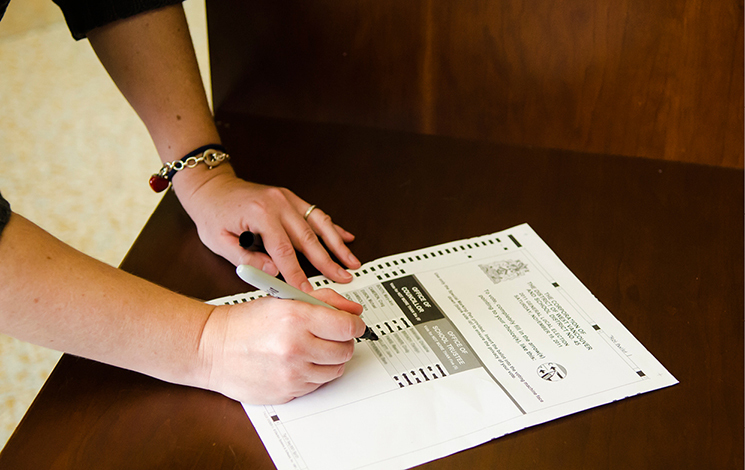 You can also register as an elector at the time of voting in the West Vancouver election. For non-resident property electors, you can register when you vote by filling in an application. *If you have a combined BC Driver’s Licence and Service Card, it counts as only one piece of identification.